Aston Villa ended last season one place and three points above the relegation zone. Takeover talks at Aston Villa have broken down irretrievably, manager Tim Sherwood has revealed. Chairman Randy Lerner had been discussing a £150m deal with a consortium who were granted exclusivity, but that period has passed with no agreement. Sherwood told Sky Sports: "I think it's dead now, to be honest." 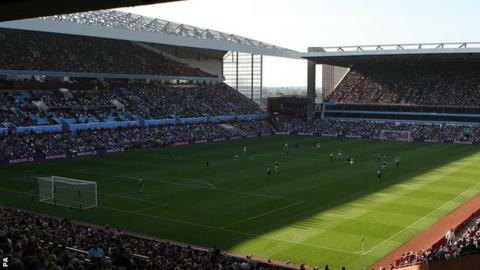 Villa were the subject of a bid in May by a group of investors led by former Chelsea business director Paul Smith. The club - who were beaten 4-0 by Arsenal in last season's FA Cup final and finished one place above the relegation zone - were put up for sale in May 2014 by Lerner. The American, who completed a £62.6m takeover of the club in 2006, announced his intention to sell, stating that he "owed it to Villa to move on, and look for fresh, invigorated leadership, if in my heart I feel I can no longer do the job". Sherwood said: "It was fairly live, but I think the people who were talking are now not there. "The chairman is picking it up and running with it now. I'm not sure if anyone is too close now. Until it's done it's never there." Sherwood added that he expects star players Christian Benteke and Fabian Delph to stay at Villa Park this summer. Benteke has been linked with a £32m move to Liverpool on the back of Raheem Sterling's £49m move to Manchester City, while Delph was expected to join City last weekend before changing his mind. Sherwood said: "I think Liverpool - I looked the other day - have six or seven strikers at the club. Now I'm not sure how many they actually need. We know Christian is a very good player and we want to keep hold of him. "If someone matches that buyout clause, there is nothing we can do about it. But until that happens, he is an Aston Villa player and we are all very pleased about that. "I knew there was interest from Manchester City and few other clubs who had shown a lot of interest in Fabian Delph, as I expected for such a small fee on the buyout clause. "But he never ever indicated to me that he wanted to leave."